Matthew Chase Brabham (born 25 February 1994) is an American/Australian racing driver, best known for being the 2013 champion of the Pro Mazda Championship. He currently competes full-time in the Stadium Super Trucks, driving the No. 83 truck. Brabham is a third-generation racing driver; he is the son of Geoff Brabham and the grandson of three time Formula One World Champion Sir Jack Brabham. Brabham at the Indianapolis Motor Speedway in 2018. Born in Boca Raton, Florida, Brabham started racing karts in 2001 at the age of 7, competing in the Australian 'Midget' class. In 2007 he won the Queensland State 'Rookie' Title, following up by winning both the New South Wales and Queensland State Junior National Light Titles and finishing second in the Australian and Melbourne City Titles in 2008. In 2009, Brabham won the 'Junior Rotax' Young Guns Title, before graduating to Formula Ford racing towards the end of the year. In 2010 he competed in the Australian Formula Ford Championship with the CAMS Rising Star Team. For 2011, Brabham competed in the Victorian State Formula Ford Series and the Australian National Championship with Sonic Motor Racing Services. In the state series he won 8 out of 12, including 7 in a row and in the national series he scored 2 wins, 2 seconds and a pole position. For 2012, Brabham joined Cape Motorsports with Wayne Taylor Racing, to compete in the U.S. F2000 National Championship. Brabham won the title over his teammate Spencer Pigot by seven points, capturing four wins from 11 podium finishes in the fourteen race season. 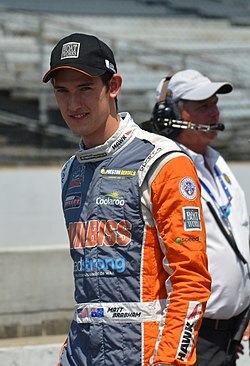 In doing so he wins a $350,000 USD scholarship through the Road to Indy to race in the Star Mazda Championship in 2013. He signed to drive the no. 27 car for Andretti Autosport in 2013. Brabham won the series championship with two races remaining capturing a series-record 11th win in his rookie season. Brabham's championship secured a scholarship to compete in Indy Lights in 2014. On October 19, Brabham and Andretti Autosport announced that they would remain together to challenge for the Indy Lights title in 2014. He won one race and collected four podiums and 10 top 5s in 14 races to finish fourth in the overall standings. In November 2014 Brabham competed in the second round of the inaugural Formula E world championship in Putrajaya, Malaysia. He replaced Charles Pic for Andretti Autosport. At age 20 Brabham became the youngest driver to compete in Formula E.
In 2015, Brabham made his Speed Energy Formula Off-Road (Stadium Super Trucks) debut at Honda Indy Toronto. He also competed at the Castrol Gold Coast 600, Valvoline Raceway (Sydney Speedway) and the Sydney 500 V8 Supercars event in the Stadium Super Trucks. He returned to the series in 2016 at the Adelaide Street Circuit securing a podium, which he backed up with a podium at St Petersburg in support of the IndyCar Series. In June 2016, Brabham swept the Detroit Belle Isle Grand Prix rounds. He later joined Team Traxxas, driving the No. 83 alongside Sheldon Creed. He finished second in the 2016 standings, 75 points behind teammate Creed. In 2017 he also finished runner up to Paul Morris by one point. He continued in the series for a fourth year in 2018, scoring his first championship in the season finale at the 2019 Race of Champions. In 2016, Brabham made his Indianapolis 500 debut, driving the No. 61 for PIRTEK Team Murray. He qualified 26th and finished 22nd. In 2017, Brabham returned to Australia to race in the Supercars Championship, making his debut at the 2017 Perth SuperSprint for Lucas Dumbrell Motorsport in place of Taz Douglas. He was scheduled to race as a co-driver for the Charlie Schwerkolt Racing team in the 2018 Endurance Cup but this drive was taken by Jason Bright. Brabham made is debut in GT Sportscars in the 2018 Pirelli World Challenge driving for CRP Racing at Portland International Raceway. He followed this up with another appearance at the final round in Utah. ^ a b "Matthew Brabham Profile". matthewbrabham.com. Matthew Brabham. Archived from the original on 16 December 2014. Retrieved 13 December 2014. ^ "Matthew Brabham to Pilot 2013 Pro Mazda Championship Entry for Andretti Autosport". U.S. F2000 National Championship. Andersen Promotions. 18 December 2012. Retrieved 5 October 2015. ^ "Brabham locks up Pro Mazda crown with Trois-Rivieres sweep". Racer. Racer Media & Marketing, Inc. 10 August 2013. Retrieved 11 August 2013. ^ Glendenning, Mark (20 October 2013). "Matt Brabham gets Andretti Indy Lights seat for 2014". Autosport. Haymarket Publications. Retrieved 22 October 2013. ^ "Matthew Brabham to race for Andretti in Putrajaya". Formula E. Formula E Rights, B.V. 20 November 2014. Retrieved 5 October 2015. ^ "Matt Brabham youngest driver in the Formula-E field". Motorsport.com. Motorsport.com, Inc. 22 November 2014. Retrieved 5 October 2015. ^ "Brabham 4th in Stadium Super Truck Debut". Matthew Brabham. 14 June 2015. Archived from the original on 7 July 2015. Retrieved 6 July 2015. ^ "Brabham booked for Adelaide Super Trucks tilt". Speedcafe. 26 February 2016. Retrieved 26 February 2016. ^ Goricki, David (5 June 2016). "Matt Brabham grabs second Trucks victory". The Detroit News. Retrieved 15 August 2016. ^ "Brabham joins Team Traxxas". Matthew Brabham. 7 July 2016. Retrieved 15 August 2016. ^ "Sheldon Creed Outduels TRAXXAS Teammate Matt Brabham for Honda Indy Toronto Victory". Stadium Super Trucks. 18 July 2016. Retrieved 15 August 2016. ^ "2016 Overall Point Standings". Stadium Super Trucks. Retrieved 15 January 2017. ^ "Brabham wins Stadium Super Trucks title". Speedcafe. 21 January 2019. Retrieved 22 January 2019. ^ "INDYCAR: Brabham secures Indy 500 drive". Racer. 3 December 2015. Retrieved 3 December 2015. ^ "Matthew Brabham confirmed for Supercars debut". Supercars.com. Retrieved 4 May 2017. ^ "Bright ready for Pirtek Enduro Cup chance". Speedcafe.com. Retrieved 1 August 2018. ^ "Brabham to make Pirelli World Challenge outing". Speedcafe.com. Retrieved 13 August 2018.